Using the development versions of Drupal modules is sometimes the best choice. Using development versions as the project[module_name][version] parameter in a Drush Make file is always a bad choice. How can we reconcile these two seemingly irreconcilable truths? The answer is actually very straightforward, and it’s even documented in Drush Make’s README.txt file itself1! I tweeted a link to this pastebin snippet the other day. Keep that open, and let’s take a closer look. ; Tell Drush Make it's a module. This might not be necessary. The comments are there for explanatory purposes, of course. They explain the basics, so let’s look at the finer points. First of all, what was my thinking behind doing it this way? 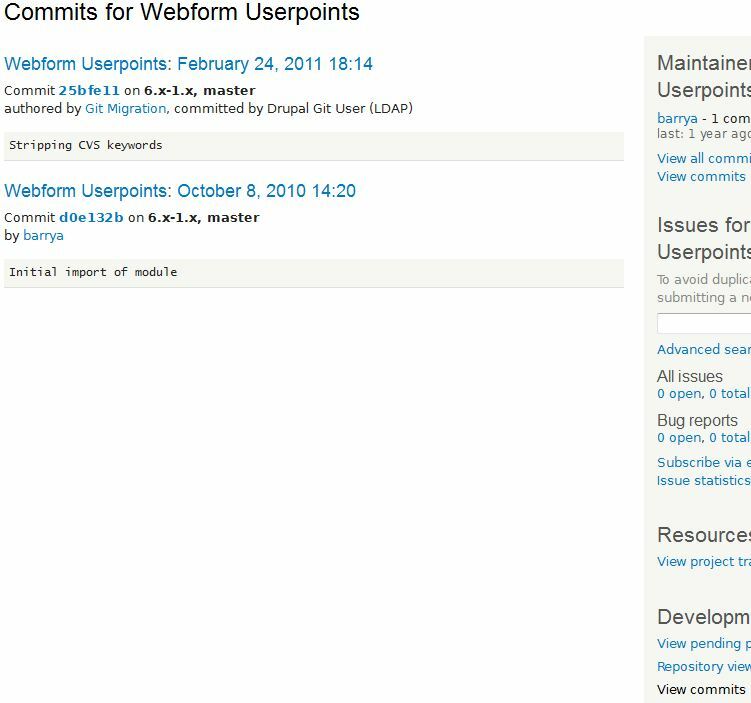 To answer that, take a quick look at the Webform Userpoints module and the available releases. I’ll wait. OK, as you can see, this module only has a development release. However, I’ve also used this technique for modules where the development version had a feature (or even a bug fix) that I needed. The benefit of doing it this way instead of simply specifying the version as “1.x-dev” is that your site will never suddenly stop working after a Drush Make (or Aegir)-based deployment because of the latest development version having different code than you expect (i.e., new code). Git repository revisions are fixed points in time and code. You can rely on them not changing. This is a very good thing. That’s the View Commits page for Webform Userpoints. It’s accessible through the right sidebar. You usually want the latest one for the development version you need. Click on it, and then click here to skip ahead. Sometimes, though, especially in actively-developed projects, you’ll find that there are so many commits that it’s impractical to find the revision that way. In these cases, the Repository Viewer is the answer. To get there, click Repository Viewer on the Drupal.org project page of the module or theme with which you’re dealing, and then under the heads section, find the one that looks like the development version you wanted. This will typically be something like 6.x-1.x. Next to that, you’ll see a few links such as shortlog, log, and tree. Click log, and then click on the title of the latest commit. The highlighted text is what you want. This will be different for you unless you’re doing this for the same revision of the same module. Bonus developer method: Clone the repository with Git and check out the branch corresponding to the development version. 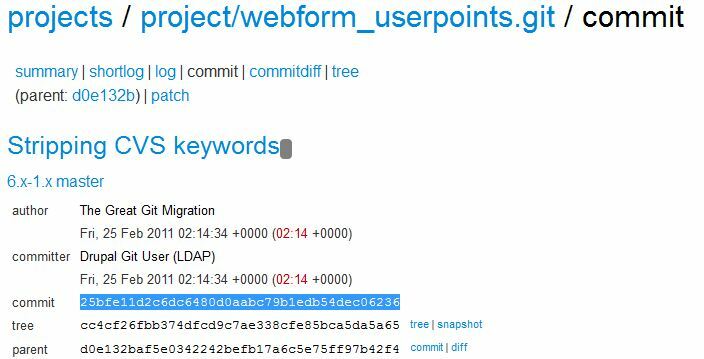 Run git log and copy the full commit identifier. Stick it in the right place in the Drush Make file. You probably didn’t even need me to write all this if you’re using this method.